Grabbing popcorn by the fistfuls has led to many a problem for the modern man. Crumbs dropped all over your lap. Butter stains wiped on your new pants. Salty fingers that dry out your eyeballs when you wipe a tear over a faithful movie dog's demise. Eliminating these issues is the Popcorn Fork. 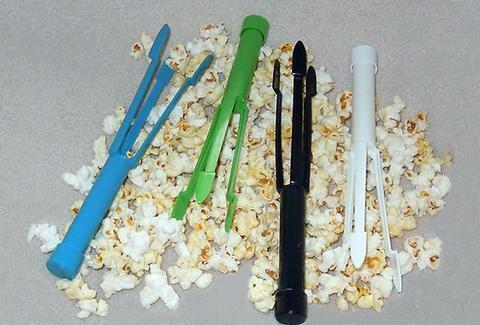 The Popcorn Fork comes with a built-in salt shaker compartment that can hold whatever seasoning you prefer. It's also available in green, blue, white, black, or sky blue. So if you hate buttery fingers and have always wanted to look like a knock-off Edward Scissorhands, your dreams can finally come true.